Below are links to the individual parts of the bundle so that you can see the ratings and comments for both or purchase only one of them. Please download the preview file so that you have a better understanding of what you are getting with this purchase. Thank you in advance for rating and commenting on this item. Please be specific when you comment so that it helps other teachers have more information. It also helps me when you are specific so that I can improve my lesson plan and PowerPoint. It helps me be a better teacher and writer. Why do I provide two ability levels for the PowerPoint? I often co-teach and we have the opportunity to have her room available so we can split up the class. When I don't have a co-teacher in the room, I choose the ability level that is most appropriate for the majority of my class. 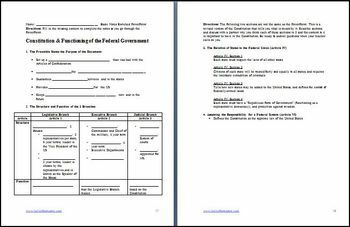 The basic version allows students time to review the content with a partner after each slide. 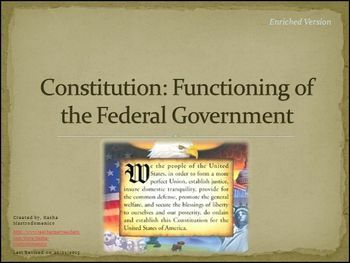 The enriched version allows students to critically think and interpret two sections of the Constitution. Please be aware that this lesson plan will take approximately 112 minutes. 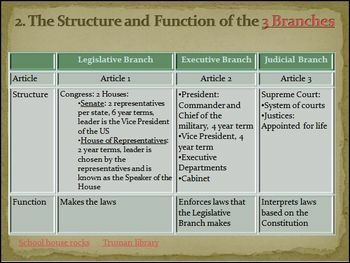 It was last revised on 10/21/2013. All links worked on that date but I cannot guarantee links because I do not control the internet. 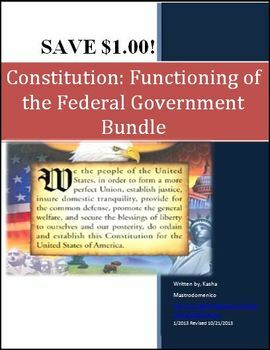 Constitution Functioning of the Federal Government Bundle by Kasha Mastrodomenico is licensed under a Creative Commons Attribution-NonCommercial-NoDerivs 3.0 Unported License.